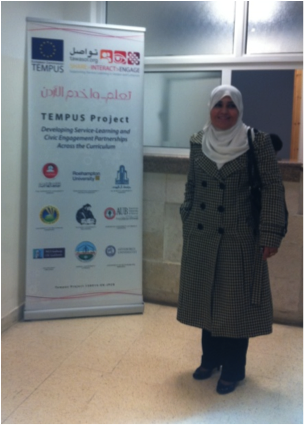 In 2010 Roehampton was awarded an EU Tempus Fund of more than 800,000 Euros to develop Service Learning and Civic Engagement in Jordan and Lebanon. ‘Tawasol’ (which means to engage, share and interact in Arabic) is the fruits of this project. Regional participating Universities are: Hashemite University, Zarqa Private University, and Al-al Bayt University (Jordan) and American University of Beirut and University of Balaman in Jordan. These universities are joined by Roehampton, National University of Ireland (Galway), University of Gothenburg (Sweden) and University of Plovdiv (Bulgaria). Tawasol Service Learning Centres have been established at Hashemite University and American University of Beirut and further centres and units are planned. The Tawasol website is a place for Tawasol members to share experiences, expertise and resources. The Director of Tawasol is Dr Michele Lamb (Michele.lamb@roehampton.ac.uk) who is also the Director of the Crucible Centre for Human Rights Research at Roehampton, where Tawasol is housed. The Centre for the Study of Voluntary and Community Activity is the University of Roehampton’s principal focus for engagement with community action and research on voluntary and community sector organisations. Launched in March 2007, the Centre undertakes, promotes and facilitates research on volunteering, community action, self-help and mutual aid, campaigning, religious and faith-based organisations and voluntary and community sector bodies. The Centre Director is Dr Steven Howlet (s.howlet@roehampton.ac.uk).